Members of Charlottetown’s Rotary Clubs and Easters Seals PEI appear before the new accessible change room at the Bell Aliant Centre funded entirely through the clubs. Left to Right: Regan Lewis, Easter Seals PEI; Paul Crant, Charlottetown Rotary Club; Pat Hughes, Hillsborough Rotary Club; Tom Campbell, Charlottetown Royalty Rotary Club. 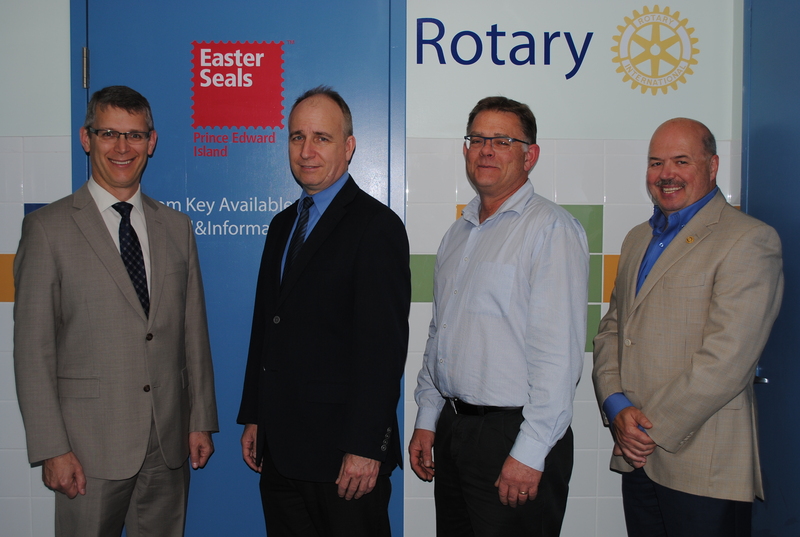 Charlottetown, PE – The Bell Aliant Centre of Charlottetown has received $10,000 from three local Rotary Clubs & Easter Seals to fund an adjustable adult change table and portable stairs for the Aquatics facility. Included in this group effort is the Rotary Club of Charlottetown, the Rotary Club of Hillsborough, the Rotary Club of Charlottetown Royalty and Easter Seals PEI. The Bell Aliant Centre is a non-profit recreation centre serving the Greater Charlottetown area with accessible recreation programming for residents and visitors. The Bell Aliant Centre’s Aquatics facility annually serves over 100,000 patrons of all ages and demographics and is delighted that the Rotary Clubs have stepped up to modernize the Aquatics facility for those with mobility issues, to ensure that patrons of all ability levels can transition from change room to pool deck with ease. Rotary is international in scope and local in delivery, building stronger communities and improving the quality of life for all residents of our region. This year’s theme for Rotary International is Rotary Serving Humanity and Charlottetown area Rotarians have been serving the local community for almost 100 years, with the first Charlottetown club forming in 1917. Since that time millions of dollars have been directed to programs and services locally and internationally. This year the Rotary Club of Charlottetown Royalty is proud to have become a gold benefactor of the QEH Foundation having raised over $500,000 in the last thirteen years through its annual Great Day “Fore” Health, Harry MacLauchlan Memorial Golf Tournament. This milestone is in addition to numerous other donations made by the club to such organizations as the Upper Room Soup Kitchen; Boys and Girls Club; School breakfast programs; PEI Family Violence Prevention Services; and Legacy Garden. The Rotary Club of Hillsborough, chartered in 1979 has contributed over $300,000 to the QEH Equipment Fund; supported the construction of the Soup Kitchen/Upper Room in Charlottetown; created and sustained the Strive Program at Colonel Gray High School providing post-secondary scholarships of over $153,000 since inception; supports a number of international programs such as Farmers helping Farmers and literacy initiatives in Guatemala. The Rotary Club of Charlottetown, through Easter Seals PEI is proud to support the CARI in their efforts to ensure access to their facilities for all Islanders. The Rotary Club of Charlottetown will celebrate its 100th anniversary in 2017 and Easter Seals PEI has celebrated 60 years serving Islanders in 2016. Easter Seals is also pleased to support other Island charities including Camp Gencheff, PEI Council of People with Disabilities, PEI Cerebral Palsy Association, Joy Riders Therapeutic Riding Association, PEI Association for Community Living and others.